If you’re like me, you’ve got way too many books and magazines gathering dust. There’s the Top Priority shelf in my bedroom, packed with books I haven’t touched. In the living room, the magazine pile grows at an alarming rate, itself the overflow from the magazine basket beside it. That wobbly stack is at least two feet tall now, and those issues of Wine Enthusiast, Travel + Leisure, Food & Wine, La Cucina Italiana, and Saveur are getting stale. Oh, the guilt when I glance their way. That’s why I’m making a different kind of reading list for 2014. I’m simply digging through my own bookshelves to see what tickles my fancy. Sure, I’ll pick up some new books this year (Jon Bonne’s The New California Winetops the list [@jbonne]). But honestly, why not simply read what I’ve already got, though it might be a few years old? A good read is a good read. I was reminded of the allure of great writing when acting as a judge for the Symposium for Professional Wine Writers at Meadowood for the second year running. Some 60 writers vying for a fellowship submitted two articles each, to be judged blind. I found plenty of solid, workmanlike writing and reporting in this year’s batch. Jobs well done. But rare was the prose that truly inspired or transported or excited. To find what I was missing, I kept circling back to Drinking with Men, a wonderful new memoir that I happened to be reading at the time. Rosie Schaap (@rosieschaap), now The New York Time’s Drinks columnist, came up with a clever structure: a life told through the bars she has frequented, being a serial monogamist with respect to drinking establishments. But more captivating still were her sharp observational skills (inspiring to me as a writer); her ability to conjure a living, breathing place and its motley community (very transporting; I longed to visit those watering holes in her company); and her way of carrying you along on her roving, circuitous thought-ways like a shotgun rider taking the switchbacks, yipping in the wind (yes, pretty exciting). There’s charisma in this writing. Henceforth, anytime I need a shot of inspiration, I’ll flip to her account of a negotiation with Harley Davidson bikers over possession of her boho rainbow-striped knit cap. Alternately tense and hilarious, it’s great stuff. So, after last night’s perusal of my bookshelves, I’ve selected six books for my 2014 reading list. Four are by authors who also write fiction—a promising sign, if you’re looking for character, place, and color along with your factoids (and who isn't?). Forgive me, but a couple are recycled from previous book lists, like New Years’ Resolutions that keep coming ’round. And dear reader, please send me your favorite book titles, old or new. I’ll try to get around to them someday! Does this book even need an introduction? I’ve started it several times, but writing deadlines always yanked me away. The fact that I was extremely reluctant to put it down suggests that it really does “read like a thriller,” as one reviewer blurbed. 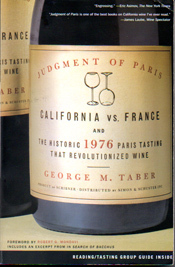 A correspondent for Time at the time, Taber (@GeorgeMTaber) was the only journalist who attended this event, an obscure publicity stunt that wound up shifting the tectonic plates of the wine world. Since he waited 29 years to write his book-length account, I don’t feel so bad for taking nine years to read it. Another longstanding fixture on my bookshelf is Robert Camuto’s first book, Corkscrewed. I happened upon it and its agreeable author at Chambers Street Wines, where he stood at a card table signing books with a silver sharpie. Despite obtaining an autographed copy, I never got around to reading Camuto (@robertcamuto) until his second book: Palmento, a vivid portrait of Sicilian wine and its new breed of makers. I recommend this to all our wine-tour clients heading to Sicily (Intrigued? Check this out), and I’ve heard New York Times wine columnist Eric Asimov say he aspires to writing that's as good as Camuto’s is here—to which I cry, “Me too!” So at long last I intend to read Corkscrewed, which the author wrote after a move to Provence. This earlier book follows his journey to all corners of France where “neo-peasant” winemakers are crafting natural wines. Not a new story anymore, but I trust it will be engagingly told. I’ve never been to Woodstock, Vermont, nor have I eaten at Osteria Pane e Salute there. But I’m curious to read this collection of essays by restaurant owner and fiction writer Deidre Heekin (@panesalute). A self-taught enophile with Italian tastes, she commands the cellar while her chef husband mans the kitchen. Heekin’s wine education led her to attempt liqueur- and winemaking, then grape-growing—in snowy Vermont, of all unlikely places. I’m curious to see how this story goes. But the book melds memoir into these essays, so there will be flashbacks to her year living outside of Florence as a newlywed and to inspirations found in Italy’s antique digestives and obscure indigenous grapes that she came to love. I was a big fan of Bacchus and Me in 2000, the first book of essays by the novelist and Wall Street Journal wine columnist (@JayMcInerney). With this latest collection, my admiration for McInerney’s writing chops remains high. It’s tough to craft short wine articles for a broad public in an engaging way. I know that from my own experience, and I saw it in those Meadowood submissions, living proof of how wine writers across the board struggle with this same challenge. McInerney has a knack for turning 1500 words on, say, Friulian wine blends in Napa into a story, something that’s anchored in full-blooded people and recollected conversations and well-observed detail. Plus, he knows how to tie up the ending in a neat little bow. They’re satisfying, these essays. Like his column, they cover a broad range of wine topics and personalities, so there’s something for all tastes here. What a peculiar topic: looking at the Italian way of doing things (for better or worse) through the lens of Italy’s railroad system. Parks, a British expat novelist and nonfiction writer who has lived in Italy for 33 years, stumbled upon the topic while commuting from Verona to Milan for a teaching gig. Some scribbled notes begat an article, which begat this book. Having spent my share of time on Italian trains—from the sleek, 200mph, businessman-friendly Italo to the milk-train that strains to crest the Apennines with its haul of local students and pensioners—I’m curious to see what worlds Parks conjures and what insights he extracts. Donna Leon is another expat novelist in Italy, but her claim to fame is a series of twenty-some gialli, or crime novels, that feature the fictional police commissioner Guido Brunetti. All are set in Venice, her home for the past 25 years. I’ve never read any of these wildly popular, English-language police procedurals (maybe next year), but their allure is reputedly enhanced by the way she integrates the milieu, social strata, and politics of contemporary Venice. That backdrop moves to center stage in this collection of mini-essays—musings on all things Venice, from the battles over garbage to the advantage of car-free streets. With so few actual residents left in Venice (only 60,000 now; but the city is sinking under the weight of 20 million tourists), it’ll be nice to get an insider’s perspective.